Did you know that Toadvine Enterprises can help you customize your scoreboard? We can help you piece together a scoreboard that is right for you based on your budget. And now is a great time to start thinking about a new scoreboard for your facility. 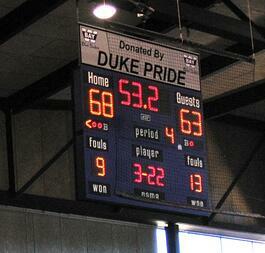 We are running a special on scoreboards: buy two indoor scoreboards and receive a free indoor school name sign. This offer is valid through November 16. Many facilities are adding protective nets and screens. It may not happen often, but an object can strike the scoreboard causing damage to the lighting or the overall functionality. Putting up a net or screen in front of your scoreboard is a simple measure many are taking to protect their investment. Electronic team names are becoming very popular, especially for facilities that host tournaments where it may be confusing who the home and guest teams are. Custom caption plates are another way to differentiate which team is which. You can have caption plates made that are easily removed from the scoreboard and can be rearranged for every game. It is a simple change out. Nevco has created cable switcher systems that allow score keepers to score multiple games at the same time. Suppose you have two or three basketball games or volleyball matches happening simultaneously. Now you have a system that will let you access many score boards at the same time. This system is for wired systems only and are ideal for larger facilities with multiple courts. For more information about Toadvine's scoreboard special, contact us today.